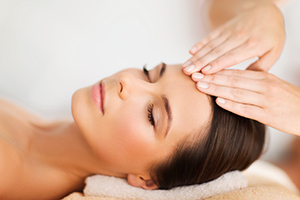 CranioSacral Therapy is a gentle, hands-on form of body therapy that evaluates and enhances a physiological system called the craniosacral system — comprised of the membranes and cerebrospinal fluid that surrounds and protects the brain and spinal cord. Using a soft touch, usually no heavier than the weight of a nickel, practitioners can release restrictions in the craniosacral system to improve the functioning of the central nervous system. CranioSacral Therapy has origins that can be traced all the way back to the 1800s with Andrew Still M.D. Then in the early 1900s, Dr. William Sutherland continued the development with the fascination that the cranial bones breathe, or move. In the 1970s, Dr. John Upledger, an osteopath, continued the work and research at Michigan State and then developed the system most widely used today by a variety of practitioners. He began the Upledger Institute and started training practitioners worldwide. Currently, there are thousands and thousands who have been trained in CranioSacral Therapy. He has been featured in Time magazine as well as on CNN. He has authored many books on the subject and continues to teach CranioSacral Therapy to this day. The craniosacral system has it’s own unique rhythm. Just like the heartbeat (beating at 70-80 beats per minute) or the respiratory system (breathing at 14-18 breathes per minute), the craniosacral system has a rhythm of 6-12 cycles per minute. Much slower than the breath or heartbeat, but no less powerful. In fact, the craniosacral system influences most all the other systems in the body. Most people are familiar with the heartbeat and the breathing but because the craniosacral system is so subtle it’s harder to feel. So it went undetected for a long time. It’s always been there helping us out, but just recently we became aware of this body system. As a practitioner of CranioSacral Therapy, Dr. Flynn works hands-on with your body and your nervous system to help re-establish balance and optimum function. She does this by helping to relax any tension from your head (Cranio) to your tailbone area (Sacral). In reality, she actually works from head to toe, not just the head and tailbone area, since your whole body is connected. She works with the muscles, fascia and fluids to positively affect the musculoskeletal system, as well as the nervous system. Dr. Flynn assists your body in releasing any sort of stress or tension so that your body can get updated and simply work better and easier. The result is a relaxed body/mind that is able to function more efficiently, effectively and more in harmony with who we are at the deepest level. CranioSacral Therapy is extremely safe & gentle.